Jake’s, known for its “off-the beaten track” atmosphere, is gearing up once again to offer locals and foreigners alike its annual staging of the Jake’s Off-Road Triathlon set to take place on Sunday, April 26th . This year, however, the organizers are adding a brand new mountain bike race (Jake’s Mountain Bike Race) joining the traditional Sunset Resorts 5K Run on Saturday afternoon. The Jake’s triathlon is one of the biggest events organized each year in this small fishing village and it has garnered consistent support and accolades as not only an exciting sporting event, but also as a successful community fundraiser. Once again Wisynco has signed on as the main sponsor with some of its flagship health brands which will assist to raise funds for BREDS- The Treasure Beach Foundation. 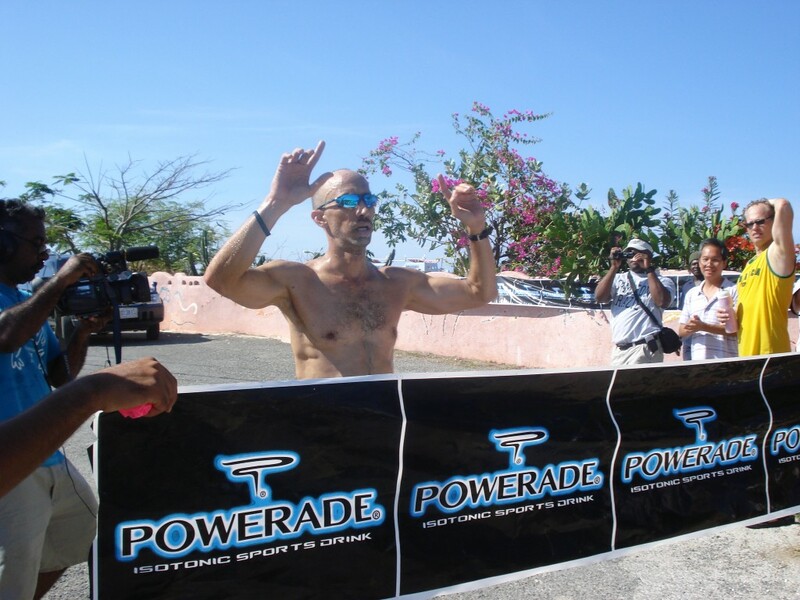 The Triathlon race begins on Sunday April 26, at 7 am with a 500 Meter Ocean Swim in Great Bay, followed by a 25K Mountain Bike course and ending with a 7K Country Run. Athletes will be challenged both mentally and physically as they steer their way through the rugged terrain of the South Coast. 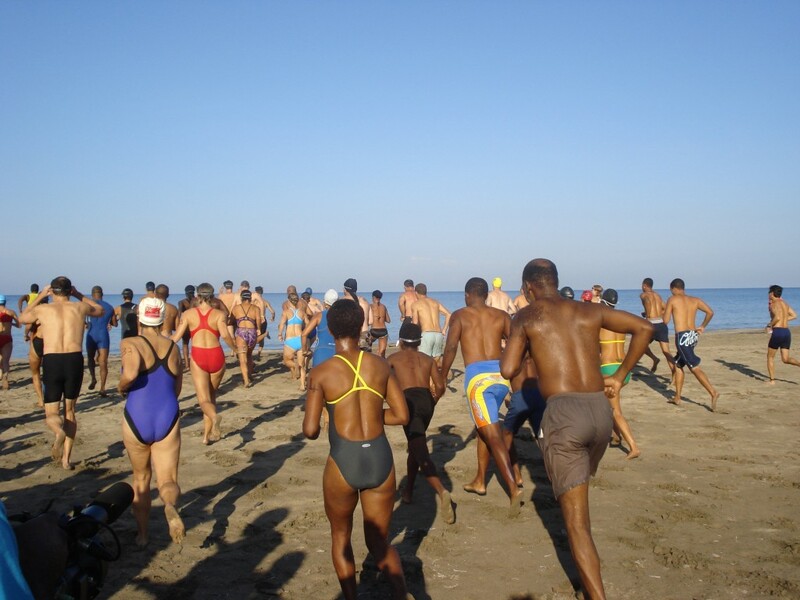 The race culminates at Jack Sprat Seafood and Pizza Restaurant where there will be an awards ceremony for the winners followed by an exciting beach party. The event is open to both individual participants and relay teams and will include both Female and Male categories, as well as juniors. Prizes will be awarded in several different categories and will include weekend getaways for two, mobile phones and a brand new TREK Mountain Bike worth US$1,000. Local registration begins 12Noon on Saturday at Jack Sprat. 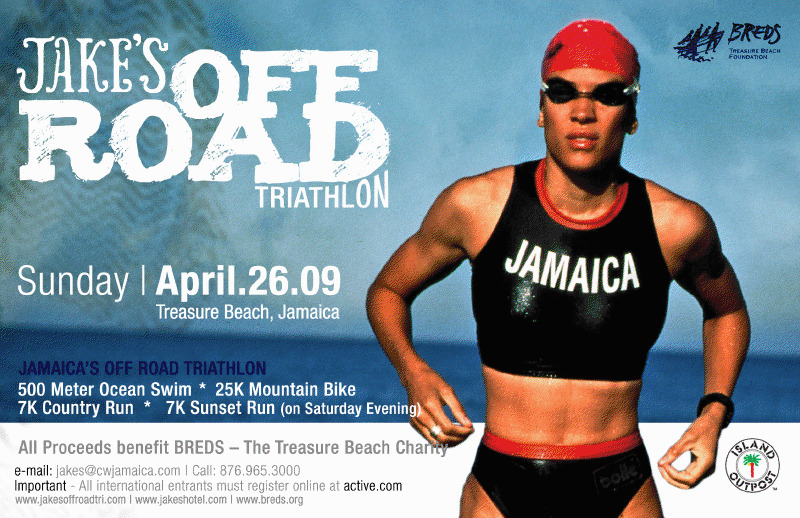 Jake’s has the only off-road and community centered triathlon of its kind in Jamaica. Each year athletes arrive ready to compete, but also to enjoy a weekend of great food, fun activities and warm people. To expand on the weekend’s activities, this year Jake’s has teamed up with the Jamaica Cycling Federation to organize a new off-road mountain bike race that will begin Saturday (April 25th) at 2pm. The circuit will consist of two laps totaling a distance of 14 miles and is the first event counting for the 2009 Jamaica Mountain Bike Championship. All proceeds from the event go directly to Breds, a non-profit organization that promotes Education, Sports, Cultural Heritage, and Environmental awareness in Treasure Beach. Proceeds from last year’s event were put to good use in starting Phase I for the new Treasure Beach Sports Park, which includes a professional size football field, a cricket pitch, tennis courts, basketball and netball courts, playground and community center. Other sponsors include Jamaica Standard Product, National Supply, Wallenford Blue, Sunset Resort & Villas, Strawberry Hill Hotel & Spa and Issa Resort Collection. For information about the Inaugural Jake’s Mountain Bike race, contact Vaughn Phang at vaughn.phang@jamaicacycling.com.